I fear us niggas have grown spoiled. like these run down houses with electrically surging coils. Only to remember when the smell makes our mucous membranes broil. Man, we used to use lard for lotion now it’s fancy cocoa butter oil. yet we still suffer at the hands we hold to as loyal. Prisoners in Alabama went on strike across the state starting May 1st, refusing to work. Many of them are reportedly still on lockdown. Prisoners are refusing to support the institutions which abuse, neglect, and enslave them. The rebels in Alabama prisons have been getting a lot of attention in Georgia too. 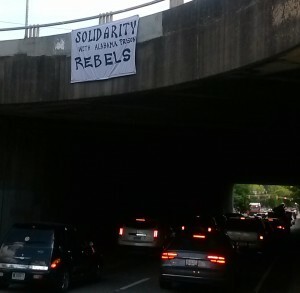 A banner was spotted in Atlanta showing a message of support for the strikers.